But the cabin always drew me. It was awesomely dilapidated, the windows empty of glass, the floorboards rotted out, surfaces powdery with dust, mouse chewings, and droppings from various small creatures. But there was a large window opening in the kitchen, looking directly out to the ocean. I wondered what it would be like to work in that kitchen, hearing the relentless wind howling outside while gazing at the infinite horizon from the snugness of this minimal space. Outside were the remains of several outbuildings, rotten fence posts, old wheel and horse-path ruts; but the thing that intrigued me was the patch of Red-Hot Poker flowers near the cabin, and a bit further north up the beach, on the brink of a craggy cliff, a single agave cactus. I felt sure a woman had lived here, and planted those exotics. I think there were daffodils, too, in the Spring. Who was this woman—and what was it like to live in a place as wild and beautiful, but lonely, as this? 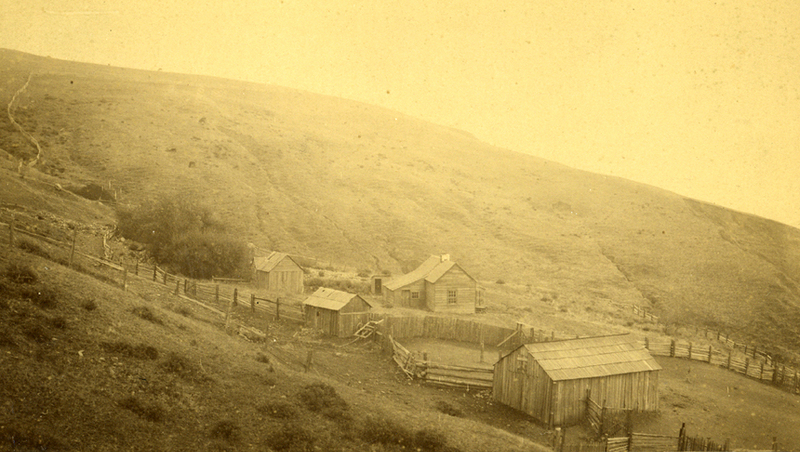 The Mackey Ranch, early 20th century. Photo from the Mary Rackliff Etter Collection. The latter question was posed to present-day beach dweller John McAbery by a San Francisco Chronicle writer earlier this summer. The article described the life of a diligent artistic couple, woodcarver John and his partner Gretchen Bunker, in their own hand-built cabin at the mouth of Four-Mile Creek. (The comments section after the main article was as gratifying to me as any part of it, because nearly every one of about 100 writers expressed envy and admiration, and several conveyed eye-rolling wonder that anybody could handle such a lonely life so far from the comforts of civilization.) Well, a lady named Doris Long, of Alameda, caught the article and was moved to send a letter and some old photos to John and Gretchen. 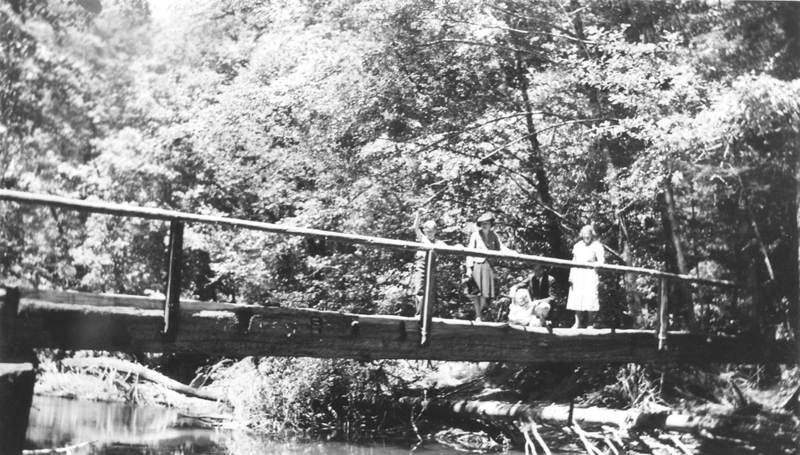 She had been friends with the Mackeys and visited the cliffside cabin in the early 1940s, when she was about six years old. Another visit brought her back to Petrolia in 1949, and there are photographs from that trip as well. John and Gretchen forwarded the pictures to the MVHS, i contacted Doris, and here we have her tales of John W. and Florence Mackey. But her childhood memories of them paint a warm picture. Let me begin by quoting from the letter Doris sent the McAberys: “I read the article about you in the SF Chronicle last Sunday and it brought back many memories of my trip to the area where you live. 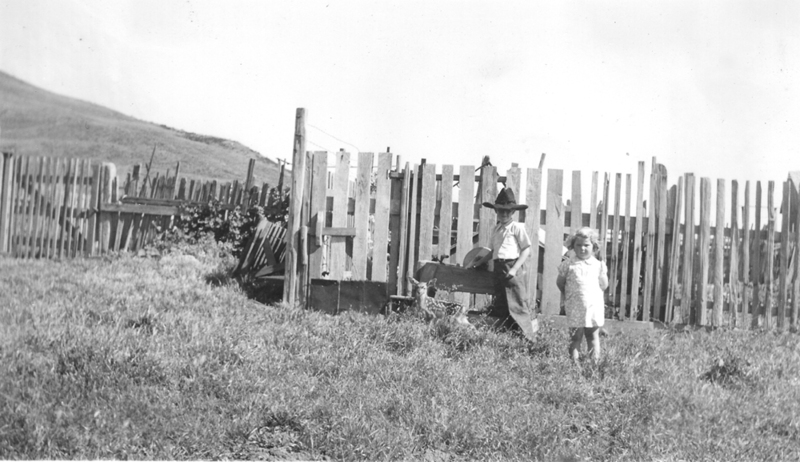 Our family friends, John and Florence Mackey, owned a ranch on the coast. The enclosed pictures were taken on our trip over 70 years ago!! The Mackeys had a home in Petrolia, right on the river, and Florence spent most of her time there. John ran cattle on the ranch and spent most of his time out there. When Florence needed to get a message to him she called the Punta Gorda lighthouse and they raised the message flag that John could see from his house [down the coast a couple of miles; binoculars helped]. They had no children but I am sure if there are any really oldtimers around they would remember the Mackeys. 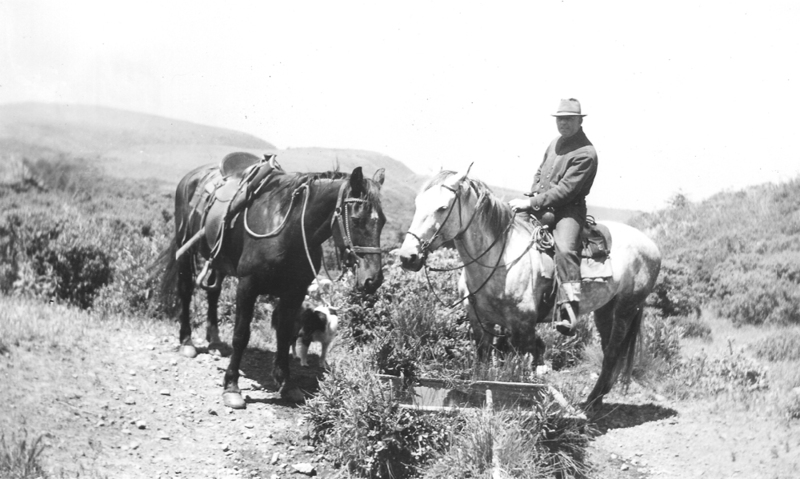 “There were no roads out to the ranch so we had to get there by horseback. They would watch the tides and at low tide we would get out and go along the water. Sometimes we would get caught in a cove and have to wait for the 7th wave to get around the point of land. Many years later John put in a Jeep road overland. Of course, their ranch house was really kind of primitive. I remember the outhouse was facing the water and it had no door on it because when you were in there it was the farthest point west… and no one was going to be passing by! 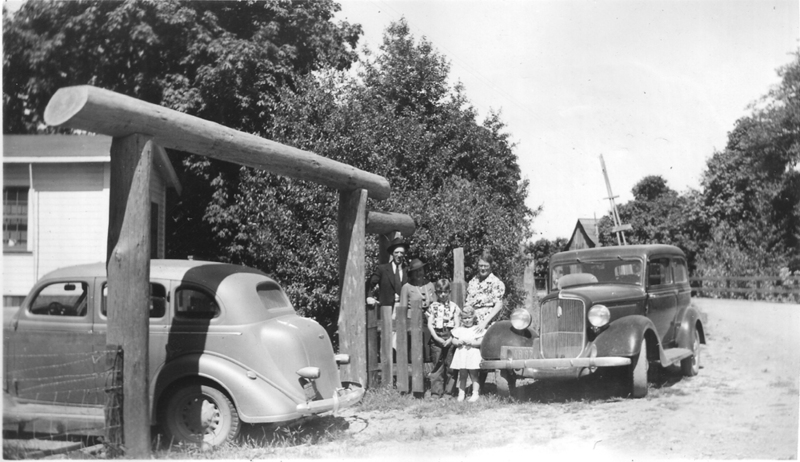 John and Florence Mackey in front of their Petrolia house, 1941 or ’42; Eddie, Doris, and their mother Ethel Geib. 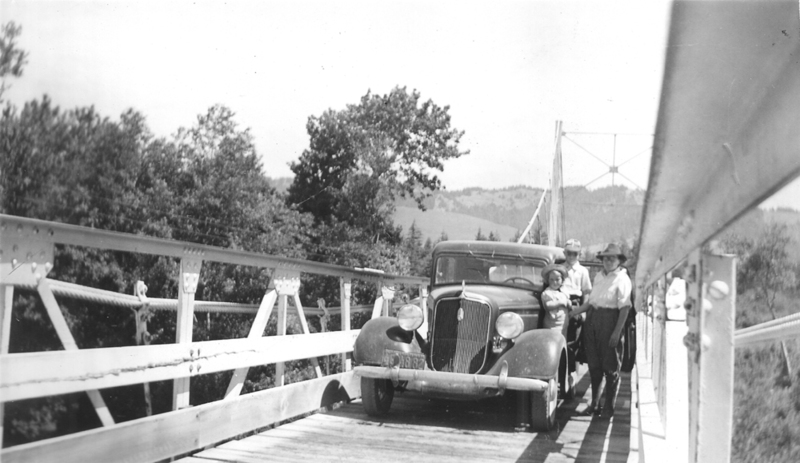 The nice borrowed car and Doris, her brother Ed, and mother on the bridge crossing the Mattole on the way to the beach. 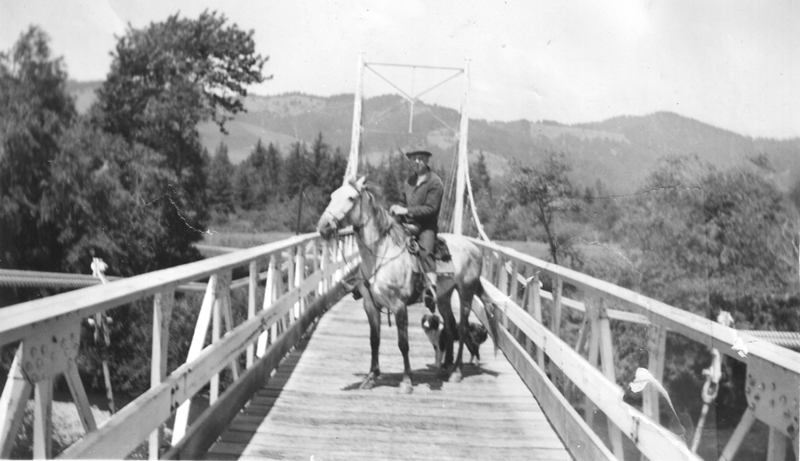 Doris’s dad Milt Geib crossing on the bridge, which was replaced in 1957 by the present span near the old Hideaway. Not sure which creek this crossed; maybe East Mill Creek? Beginning the trip: on the beach perhaps at the Punta Gorda Light Station gate? 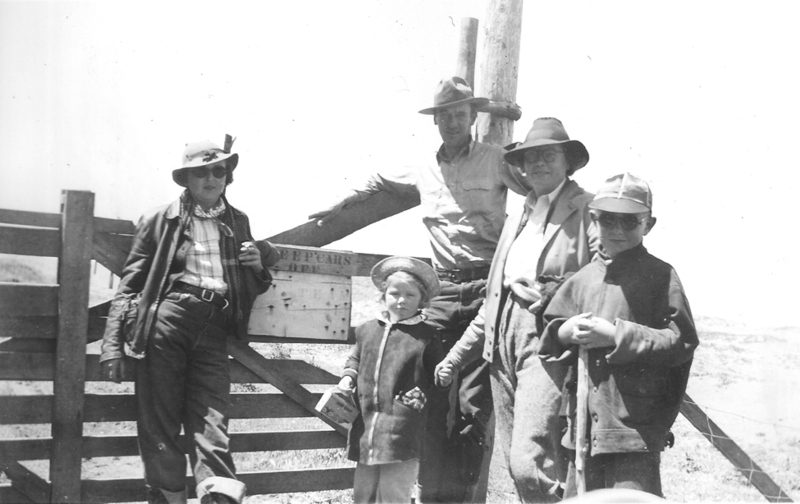 From left, Florence Mackey, young Doris, John Mackey the cowboy, Doris’s mom Ethel, and big brother Ed. Watering the horses at a springbox. Doris and dad relaxing at the mouth of a creek, heading down to the Mackey ranch and cabin. 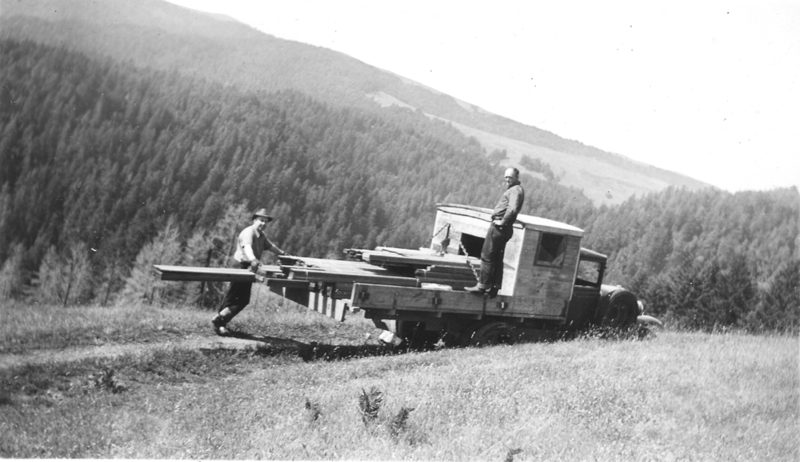 Out on the ranch, in a section accessible by truck. Eddie in somebody’s hat, Doris, and don’t miss the little fawn! Doris and i spoke on the phone and she filled in some of the details. Her family made the trip up to Petrolia in 1941 or ‘42, when she was about 6 and her brother Ed, who recently passed away, about 10. Doris noted that now that Ed is gone, she is the only one in her family with any memories of the Mackeys left. Since her dad worked for Don Lee, who specialized in Cadillacs, the car they drove up (and pictured here) was a very comfortable and luxurious vehicle borrowed from the dealership. We couldn’t pinpoint exactly where the Mackeys’ Petrolia house was, though i’m pretty sure it was either just downstream of the end of what’s now called Old Coast Wagon Rd., or on Conklin Creek Rd. at the mouth of East Mill Creek; perhaps these pictures or somebody’s property title will give a clue. Florence didn’t go out to the cabin much, but she did make this trip with the Geibs. John went down the beach by horseback in those early days. Doris’s mother would not get onto a horse, and she walked the whole distance to the cabin via the mouth of the river, a journey of several miles and over varying terrain. (That excursion, and a visit to Yosemite, were the only two times Doris remembers her mother wearing jeans.) 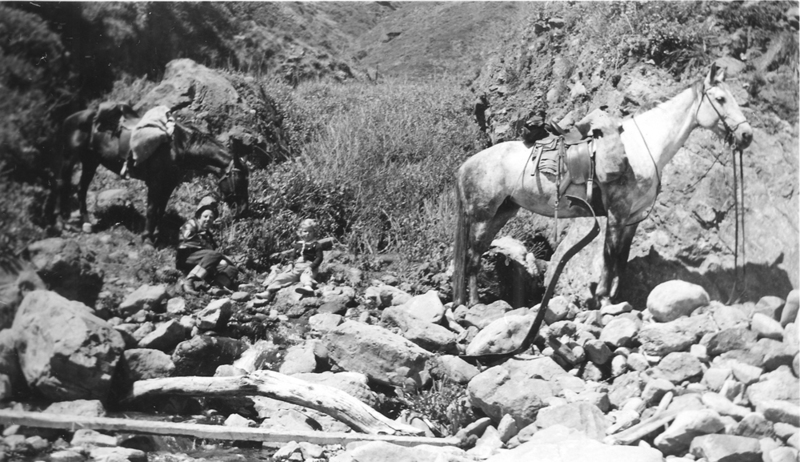 When they got to a steep part of the trail, Flo told Mother, “Hold on to the horse’s tail!” for a little lift. Doris’s family had quite a collection of Japanese glass floats, which they got from John and Florence. Eventually they were all given away by Doris’s father, though. 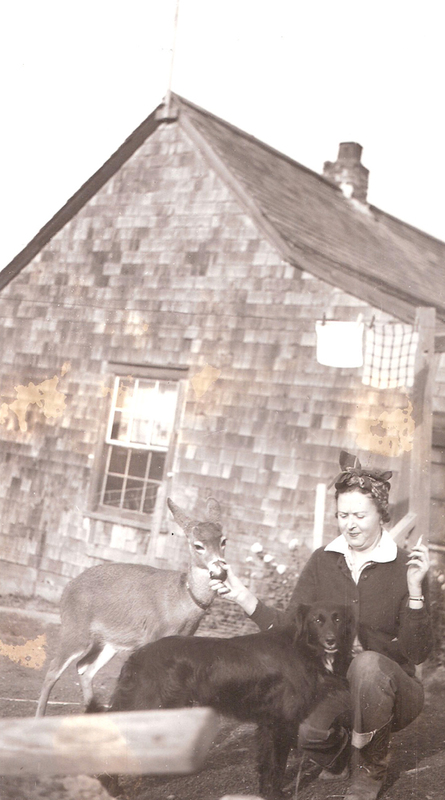 This and the following shot are of Florence with her pet deer. 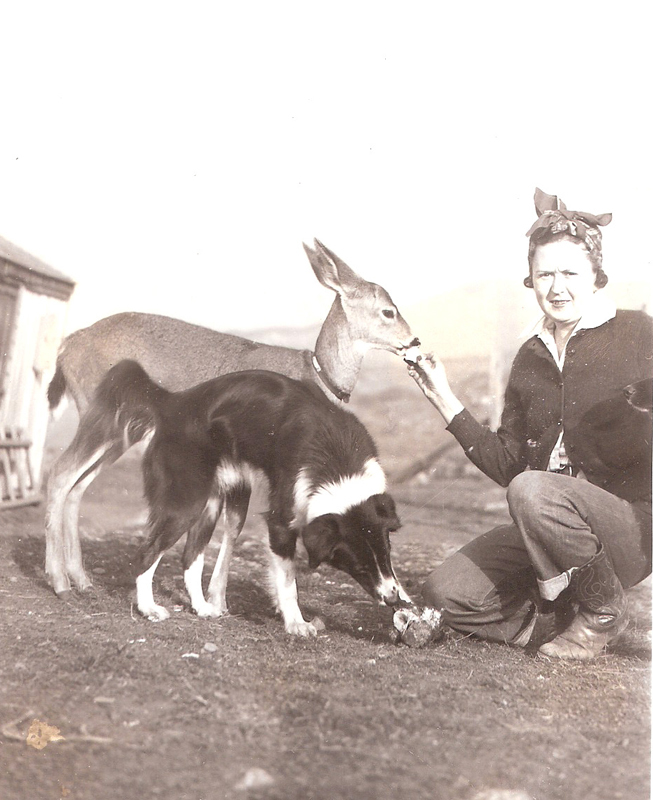 The photos were taken in 1939, and given to Doris’s family. Doris remembers the Mackeys joking with her about shyness in using the doorless outhouse: “Who’s going to look at you, the Chinamen?” However, a steer or bull did come and stare at her during her usually solitary operation. John W. Mackey was a big, lanky man, tall and thin. Of course, Doris says, she was impressed that he was actually a cowboy! He loved to joke and tease. Both he and Florence loved to drink. In fact, Doris believes he died of cirrhosis of the liver. He was lying in a hospital, dying, and he asked for a bottle; Flo passed it in through a window then came around to visit and drink with him. He said, “Be careful not to let the nurses see it,” but by then, everybody knew that it really didn’t matter anymore. Flo drank boilermakers; she would drink all day and never seem to get drunk, never slur her speech or in any way dismay the kids. She’d get a beer and put in a shot of her own liquor, which she always brought when she visited Doris’s parents. “You don’t need to buy my booze!” she told them. Well, my original idea of a woman living a lonely life by the sea was not in the least accurate; Flo was a warm-hearted, fun-loving gal who wouldn’t have chosen that kind of isolation. I don’t know, but still imagine, that she must have planted the flowers though. Many thanks to Doris Geib Long for these pictures and precious stories; and to John McAbery and Gretchen Bunker for passing them on. A little Mackey family history: There were three John Mackeys in Petrolia history. The first was John A. Mackey, brother of Patrick Mackey, who emigrated here from Nova Scotia and Ireland, respectively. John A., born in 1938, married Honorah O’Leary, sister of Patrick and Cornelius O’Leary. Together, John and Honorah had at least nine children, of whom four died in 1880’s Scarlet Fever epidemic. One of the survivors was John Joseph Mackey, born in 1878. He married Nellie Kathryn Funge, born in Utah in 1875 of an Irish father and genteel mother from Ohio. The senior John and his son John J. ran the Mackey Store across the street, south, from the end of Sherman St. (which runs in front of the present Petrolia Store). The Mackey Store burned in 1903. Nellie K. and John J. Mackey had three children: Nell K., later Mrs. Wyllis Young, 1907 or ’08 -1991; Mildred Margaret, aka Molly*, 1905 or ’06-sometime in the 1960s; and John William Mackey, born 1903 and died in the 1950s. This John W. Mackey married Florence Lenora Anton in the 1920s. Florence’s father was Scottish-born James Anton, and her mother Florence Lenora Crain, from Missouri. Flo was born in Fresno in 1907. 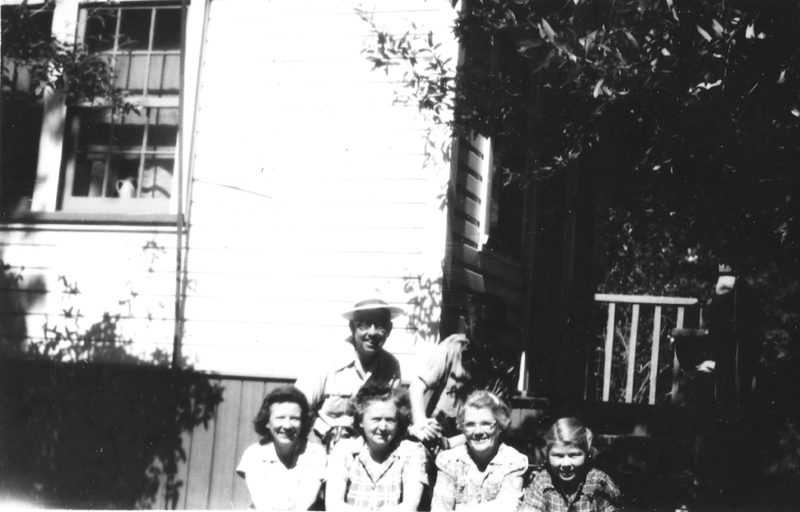 By 1930, John and Florence were married and living in Alameda; John was a paper salesman. They never had any children of their own. Florence died in San Francisco of lung cancer in 1968. She returned to Humboldt County to be buried in St. Bernard’s Cemetery, Eureka. * Note that Molly, or Mildred Margaret Mackey, later became Mrs. Don Roberts, and lost her husband and son in a drowning accident; then she became Molly West through a later marriage. One of her loves, i was told, was the Clark man who died in a Jeep rollover out in the Cooskie range. I have a few pictures of her, and several people have asked me about her. If anyone has any stories to share about Molly West, please let me know. I heard that she, like her brother and sister-in-law, loved the bottle. She kept herself pretty soused until the end, which came of a pill overdose in a Eureka motel room. Who could blame her, though, with the trouble she’d seen.